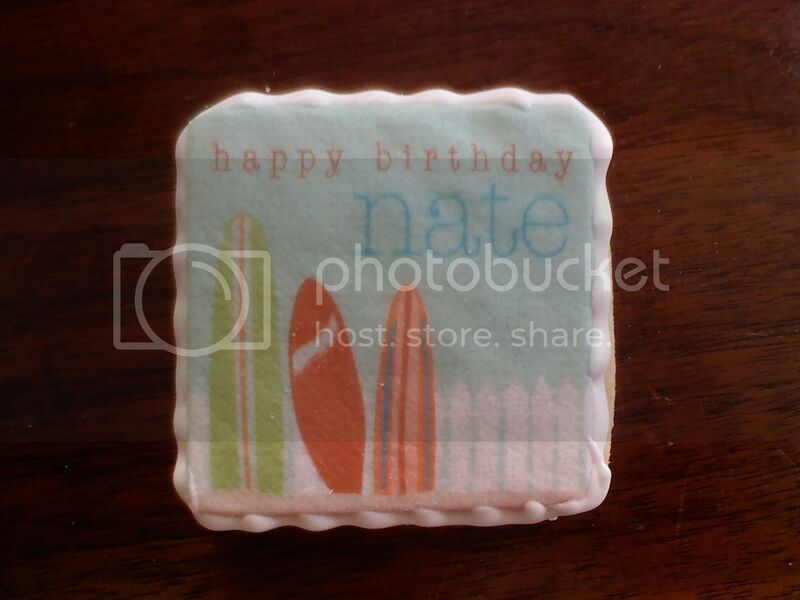 so here's the scoop on how i created these amazingly cute cookies for nate's surprise b/day party a couple of weeks ago. this one turned out to be my favorite...not just because it's super cute but because nate actually surfs! first off...i have to mention my source for inspiration. i was on amy atlas' site and she mentioned better bit of butter cookies. i checked out the site & i was inspired. so i spent the next week trying to work on my own cookie recipe along with a homemade fondant & royal icing. after a week of frustration and using the girls and j as guinea pigs i was then inspired to just order a batch from better bit of butter cookies to see for myself just how good her cookies taste and to see upclose & personal the design elements behind these spectacular cookies. (very tasty and very beautifully designed - i highly recommend ordering from her if you don't want to attempt these on your own). while i was waiting on my order to arrive, i spent the next week perfecting the recipes i had been working on. to my delightful surprise, my cookies turned out to be "right on point" compared to bbb's. yea!!! (i must mention, bbb's arrived beautifully packaged and were wonderful and HUGE). so i then spent the next week designing "luau-related" cookie images using adobe illustrator and my wacom tablet. i found a local baking supply store, d&g occasions, who printed my .jpeg image onto icing sheets for me. all i had to do was email it to them. 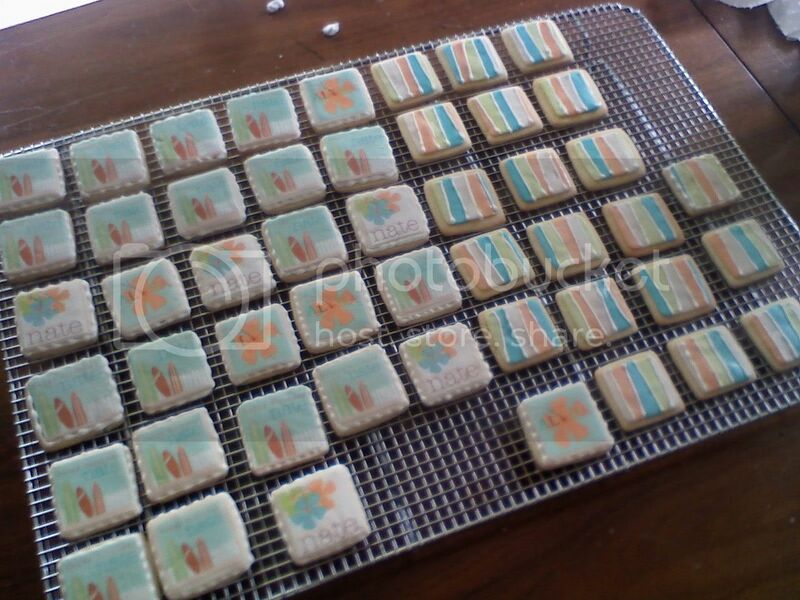 i knew if i did "smaller" cookies i could get more luau images onto one icing sheet. (at $7/sheet i wanted to keep my costs down - so i decided to do 2"x2" square cookies and squeezed 16 square images onto one sheet and had 2 full icing sheets printed). i emailed d&g my images and drove 45 minutes to pick them up. (i could've had them mailed to me but never having worked with the icing sheets before, my time was limited and i didn't want to chance the mail). one thing to note...the colors i was seeing on my screen and the colors that actually printed were a bit off. 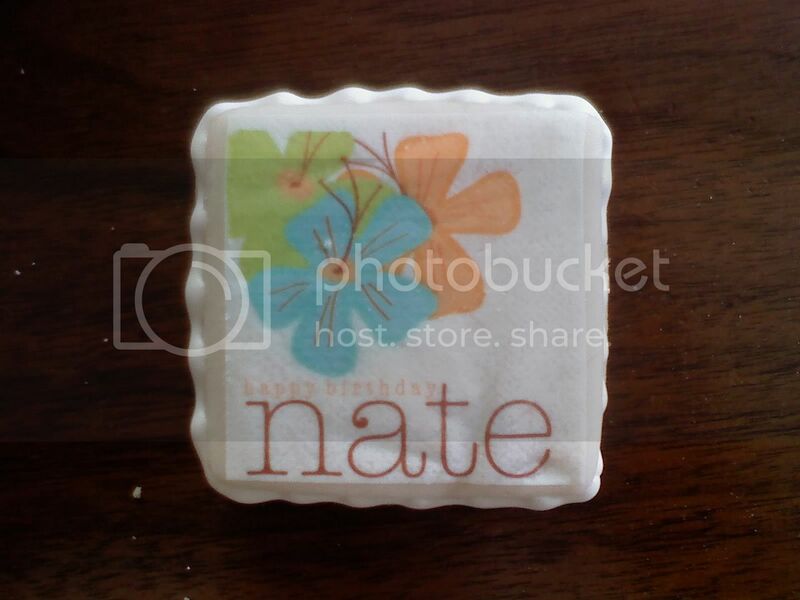 look at this one..."nate" and the "flower details" look like a "burnt sienna or burnt orange" color. on my screen they were supposed to be brown. so here was the process: (i should've taken pics of the process but i didn't)...darn it. day three: prepare royal icing. roll out & cut fondant and apply to cookies with a small brush and water. 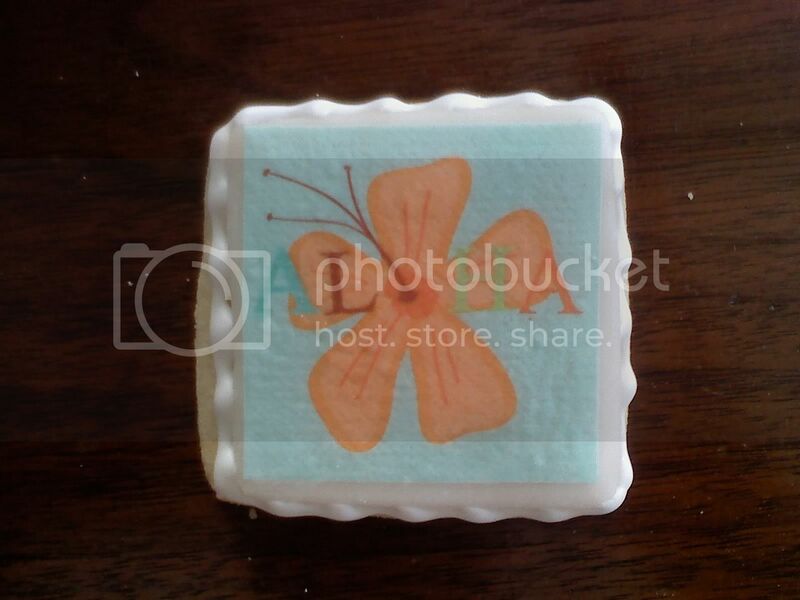 cut out icing sheet image and apply to fondant with small brush & water. pipe on royal icing and let sit for 24 hours - uncovered. i created my colored fondant. (orange, blue, green and left some white). i rolled out into 1/8" thickness. i then used a square cookie cutter - slightly smaller than the original one i used to cut the cookie dough. (this will allow you more room for adding royal icing accents). i cut squares from each color fondant and then i stacked the squares and used a large square cookie cutter to act as a knife to cut "strips" through all four layers of fondant at the same time. i cut some at angles to make it a little more fun and not so "precise". 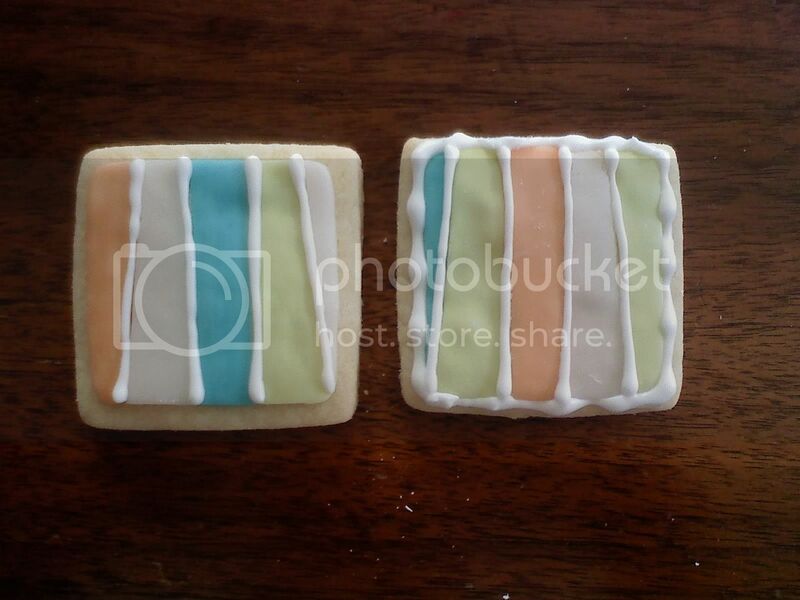 then i pieced one layer of all of the fondant colors together - on one cookie. (actually, i unstacked the layers of cut fondant and laid them out on the cookies first to make sure they were how i liked them. i then removed the layers from one cookie at a time onto wax paper. i played around with them a little bit to try to get them lined up and squeezed together. i even ended up using another smaller square cookie cutter to trim all fondant strips so they were "perfectly aligned" on all sides. i didn't remove the the cookie cutter until after i used it to slide the pieces of fondant to the edge of my table/counter, right onto my already "water-brushed" cookie. i used the water to help make the fondant slightly damp in order for it to "adhere" to the cookie. i tried using vanilla vs. water but it stains the cookie a little bit. besides, i use the really "high-end" vanilla so if water works just as well then i figured i'd save myself some money by saving my delicious vanilla. once the fondant was on, i then piped on my royal icing and let the cookies sit - uncovered - for 24 hours. 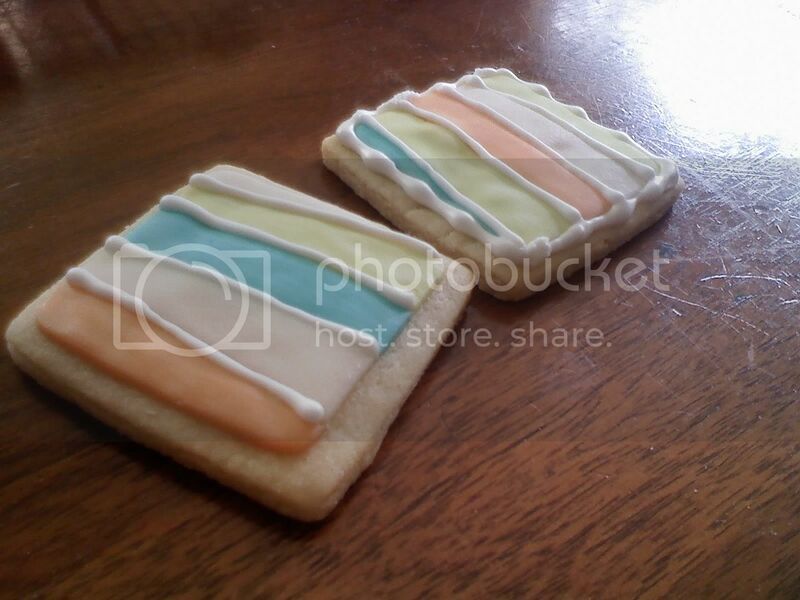 the way i presented the cookies at the party - which i wish i would've taken a picture - i ended up crushing up some vanilla-creme sandwich cookies in a blender so that it resembled sand. i then used this southern living @ home serving dish (this is a cake stand and then when you flip it upside down it serves as a vegetable tray and you can put dip in the center...very versatile). i filled the bottom with the cookie "sand" and staggered the cookies around the entire dish. i even stuck a pineapple on the top portion of the serving dish. it was cute. 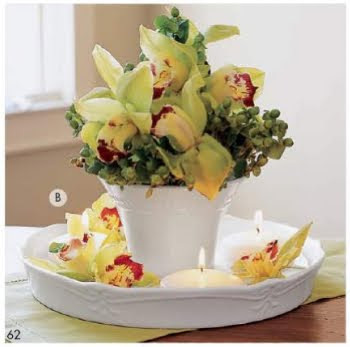 (by the way - looking up the link to southern living @ home led me to their ONLINE catalog. it's spilling over with decorating and holiday ideas...go feed your creativity). it was definitely a tedious process. but it was a labor of love. (and i love the little details of projects like that). questions? tweet me or leave them here! how cute!!! I will have to remember this for our next "celebration"!! These are the best!! I can see them now with House of 3 halloween decorations on top!!! Thanks for the ideas and links! **Is your frosting recipe secret?? 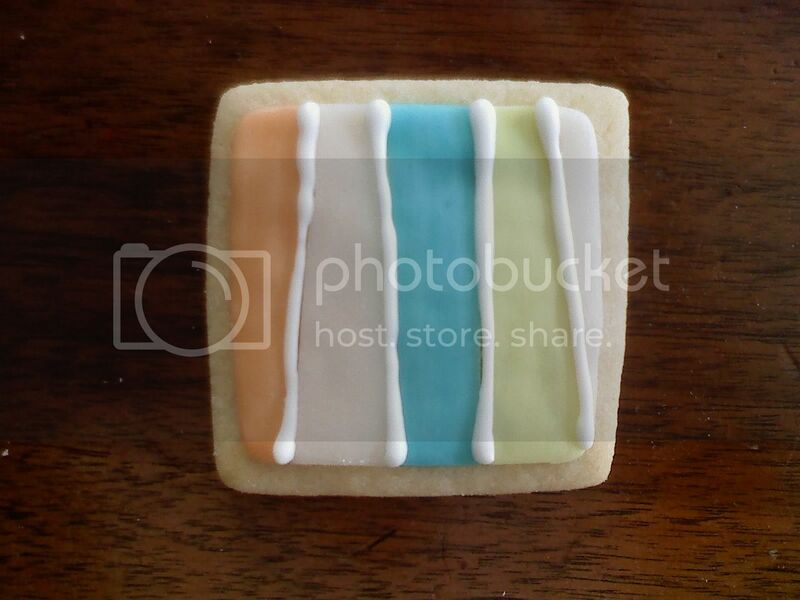 candi - i totally can see house of 3 stuff ALL over cookies like this. (i even contemplated making some for rhonna, heidi & janet - just to knock their fabulous socks off). email me for the recipes...are you looking for the fondant, royal icing or both?